Bask in the glory of the Caribbean sunshine on the deck of this beautiful French-made 44-foot sailing catamaran, now available for private charters in the northern Riviera Maya. Free-flowing drinks, snorkeling, sailing and fun! This boat is also available for sunset cruises, which are always a blast. Located near the small fishing village of Puerto Morelos, we recommend this catamaran for people staying anywhere from Cancun to Playa del Carmen. 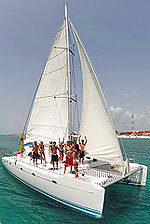 If you're staying in or south of Playa del Carmen, see our 45' Catamaran Charter that will be more convenient for you. You can do either a morning snorkeling cruise or an afternoon sunset cruise. On the morning trip we'll sail to the Great Mayan Reef and the Puerto Morelos Arrecife Marine Park where we'll snorkel in the clear blue-green waters of the Riviera Maya, the best location in the area. We'll sail toward the fishing village of Puerto Morelos, and along some of the most spectacular beaches in the Riviera Maya. Then we'll return to the marina where you can have lunch at our waterside restaurant if you wish, for an extra cost per person. On the sunset tour, we'll sip wine and nibble on snacks as we sail on the warm Caribbean waters, before seeing the sun set over the beaches of the Riviera Maya, quite a scene. You can have dinner at the restaurant, or lunch before the trip if you like. Both trips are set with fun music, a great crew and good times. Tour Schedule: Morning Snorkeling Tour at 9:00 AM. Afternoon trip can start anywhere from 2:00 PM to 3:30 PM depending on the season and sunset time. Departs: Near Puerto Morelos, about 25 minutes north of Playa del Carmen and 30 minutes south of Cancun. Exact meeting instructions will accompany your confirmation. Transportation: Pick-up and drop-off is available for an extra cost per person, paid in cash on the day of the trip. $10.00 Per Person for Dock Fee and Marine Park Entrance Fee. These fees are collected at the marina in cash and cannot be paid in advance. Food & Drinks: You are welcome to bring extra food and drinks if you like. We also have the option for a 3-course lunch included on your tour for an extra cost.